Kirby 64: The Crystal Shards is a unique Kirby game that features 2.5D graphics and platforming challenge that is both similar and unique from other Kirby games. Specially released for the Nintendo 64 gaming console, the game features the titular character Kirby as he travels across six planets to collect the scattered pieces of a Crystal in which he can use to defeat the game's main antagonist, Dark Matter. Gameplay-wise, the game is pretty similar to the previous Kirby titles where Kirby can absorb enemies and take their skills for himself. 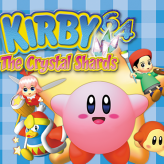 Kirby 64: The Crystal Shards is an online N64 game that you can play at Emulator Online. This free Nintendo 64 game is the United States of America region version for the USA. Kirby 64: The Crystal Shards is a single title from the many platform games, adventure games and kirby games offered for this console. If you enjoyed playing this, then you can find similar games in the n64 games category. Kirby 64: The Crystal Shards game is from the various retro games on the site, and there are more games like this, including Kirby and the Amazing Mirror, Super Mario 64: Shindou Edition and Pokemon Crystal.